Satellite TV on every screen. With EyeTV Netstream 4Sat, satellite TV loses its restrictions at last: no longer stuck in a socket wired into the wall, you can now easily record a second channel, watch another program in a different room or enjoy football in the garden. Enjoy HD-quality satellite TV on any screen in your home – whether on a tablet, smartphone, computer or TV receiver. Forget about cabling – EyeTV Netstream 4Sat makes satellite TV simply part of your home network. Your devices can receive satellite TV over your existing Wi-Fi network – anywhere in your home and even on your patio or in your garden. Satellite TV the easy way. Setting up EyeTV Netstream 4Sat is a breeze: connect it up, install the app, enjoy. You can even skip the tedious channel scan with your tablet or smartphone on popular providers such as ASTRA – plus, all of your devices find the TV signal completely automatically. EyeTV Netstream 4Sat includes free apps for iPad, iPhone & iPod touch, Kindle Fire as well as Android smartphones and tablets. Enjoy live TV in no time at all, pause the program you’re watching, and record the highlights really easily. You don’t need to deal with the technical side of things either: the app even takes care of complex functions such as LNB and DiSEqC control in the background. The latest tablets and smartphones are packed with pixels – even on small screens with Retina or full-HD resolutions, HD channels look really impressive thanks to their much greater picture quality. Thanks to automatic hardware transcoding, EyeTV Netstream 4Sat brings HD channels directly to your tablet or smartphone for the first time – without overloading your home network or mobile device. 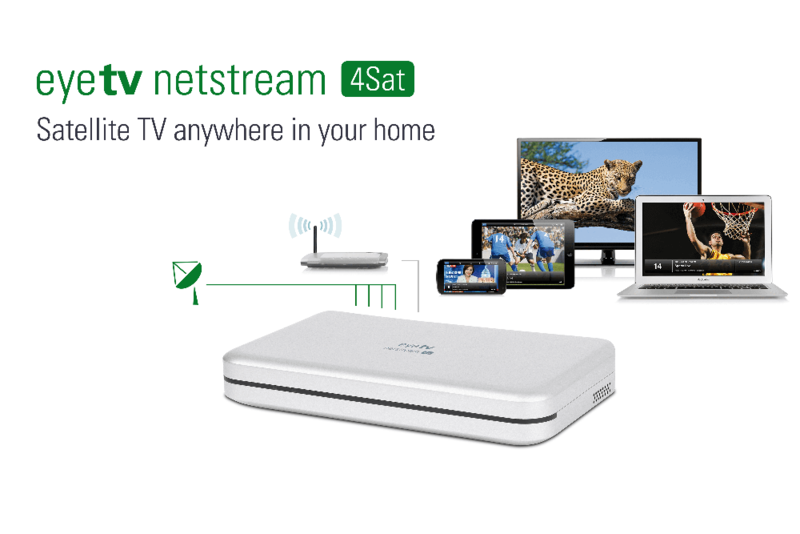 With 4 receivers, everyone in your home can watch their favourite program with EyeTV Netstream 4Sat. Almost everything with a display becomes a TV: besides apps for iPad, iPhone, Kindle Fire, and Android, EyeTV Netstream 4Sat also includes the award-winning EyeTV software for your Mac as well as THC for Windows. Your normal TV won’t be left out of the action either: thanks to the SAT>IP standard, your big screen, when equipped with one of the many certified HD receivers available, will also be part of your new intelligent TV network. For initial setup of EyeTV Netstream 4Sat, an iOS or Android device is required. Encrypted channels are not supported on tablets, smartphones and computers. Some SAT>IP receivers support encrypted channels: please ask the manufacturer of your receiver for further information. "The apps for both Android and iOS are what we'd expect from Elgato. The interface is lovely and the apps are brilliantly designed."